Khoury, Andrew C. 2018. The objects of moral responsibility. Philosophical Studies, Vol. 175, Issue. 6, p. 1357. Shoemaker, David 2018. CRUEL JOKES AND NORMATIVE COMPETENCE. Social Philosophy and Policy, Vol. 35, Issue. 01, p. 173. Menges, Leonhard 2017. The emotion account of blame. Philosophical Studies, Vol. 174, Issue. 1, p. 257. Thompson, Adam R. 2017. Blame and the Humean Theory of Motivation. Philosophia, Vol. 45, Issue. 3, p. 1345. Van Schoelandt, Chad 2015. Justification, coercion, and the place of public reason. Philosophical Studies, Vol. 172, Issue. 4, p. 1031. For providing very helpful remarks on an earlier draft of this essay, I thank Angela Smith and Matt Talbert. For their insightful questions and comments at my presentations of this material, I am grateful to several contributors to this volume (especially David Brink and Erin Kelly), Victor Kumar, David Lefkowitz, Eugene Mills, and Nancy Schauber. I am also grateful for the financial support of the Freedom Center, Tulane University, and a state of Louisiana ATLAS Grant while I worked on the paper. For their discussion and help with various aspects of the project, I thank Justin D'Arms, Terry Horgan, Dan Jacobson, Shaun Nichols, Connie Rosati, and Mark Timmons. For many enjoyable and exceedingly fruitful conversations about this material, in particular regarding the distinction between answerability and accountability, I am grateful to Steve Wall. My largest debt, though, goes to Michael McKenna, who, through detailed written comments, excellent questions, and patient (and lengthy) discussion, made me see many of my earlier errors but also helped me to express many of the ideas here in a much clearer and defensible fashion. Any mistakes and unclarities that remain, however, are most assuredly attributable to me, and I remain answerable for them. 1 Strawson, P. F., “Freedom and Resentment,” in Free Will, 2d edition, ed. Watson, Gary (Oxford: Oxford University Press, 2003), 83. 2 Fischer, John Martin and Ravizza, Mark, “Introduction,” in Perspectives on Moral Responsibility (Ithaca, NY: Cornell University Press, 1993), 6. This spectrum marks what they call our “responsibility-reactions.” I call them our “responsibility responses” not only because I think the phrase is a bit snappier, but also because “response” better connotes the engagement with the target that is indicative of many such responses. 3 See also, Fischer, John Martin, “Introduction,” in Moral Responsibility, (Ithaca, NY: Cornell University Press, 1986), 12. 4 Strawson, 77–79. I here follow Gary Watson's labeling of “excuses” and “exemptions” in “Responsibility and the Limits of Evil: Variations on a Strawsonian Theme,” in Watson, Gary, Agency and Answerability (Oxford: Oxford University Press, 2004), 219–59. 6 See, e.g., Watson, in “Responsibility and the Limits of Evil”; David Wiggins, “Towards a Reasonable Libertarianism,” in Watson, Free Will, 94–121; Russell, Paul, “Strawson's Way of Naturalizing Responsibility,” Ethics 102 (1992): 287–302; Wallace, R. J., Freedom and the Moral Sentiments (Cambridge, MA: Harvard University Press, 1994); and McKenna, Michael, “Where Frankfurt and Strawson Meet,” Midwest Studies in Philosophy 29 (2005): 163–80. 7 Watson, Agency and Answerability, 228. I have left out Watson's mention of someone unfortunate in formative circumstances who is nevertheless “cruel,” as this case is a very difficult one, and proper treatment of it would take us too far afield. For an insightful discussion of the complexities, see McKenna, Michael, “The Limits of Evil and the Role of Moral Address: A Defense of Strawsonian Compatibilism,” The Journal of Ethics 2 (1998): 123–42. 8 Watson, Agency and Answerability, 228. 10 In McMurrin, Sterling, ed., The Tanner Lectures on Human Values, 8 (Salt Lake City: University of Utah Press, 1988), 149–216. Wallace (124–33) offers a similar view, targeting “quality of choice.” For ease of exposition, I will focus solely on Scanlon's view, although he and Wallace disagree on key points. 11 Scanlon, T. M., What We Owe to Each Other (Cambridge, MA: Harvard University Press, Belknap Press, 1998), 22. 13 Scanlon, “The Significance of Choice,” 174. 14 McKenna, Michael, Conversation and Responsibility (New York: Oxford University Press, 2012). McKenna himself does not advocate a pure Quality of Will theory, for one, because he admits that “attributability” is a distinct conception from “accountability.” The latter is his primary focus in the book. Nevertheless, it's not clear even with respect to accountability alone that he's offering a PQW theory. That's because, while he thinks quality of will is at least necessary for accountability, it may not be sufficient (he remains agnostic on this point, given his uncertainty about whether, for example, freedom and epistemic conditions are incorporated into quality of will). See, for example, 61. 15 McKenna, Conversation and Responsibility, 59. Arpaly, Nomyhas put forward a PQR view whose scalar dimension (i.e., what it is that makes actions more or less blameworthy and praiseworthy) requires only this latter feature, the concern one has for moral considerations, whether one is aware of those considerations as moral or not. See herUnprincipled Virtue (Oxford: Oxford University Press, 2003), 79–84. 16 McKenna, Conversation and Responsibility, 59; emphasis mine. 17 This is what marks one difference, I think, between McKenna and Scanlon, given that Scanlon says explicitly that one's attitude toward others is constituted by “[t]he agent's reasons for acting (and the fact that other considerations did not count for him as reasons against so acting)….” Scanlon, T. M., Moral Dimensions (Cambridge, MA: Harvard University Press, Belknap Press, 2008), 152–53. I will discuss what I take to be the most important difference between judgment and regard later in the paper. 18 Watson, Agency and Answerability, e.g., 229–33. 19 McKenna, Conversation and Responsibility, 78. 21 From the conference for the 50th anniversary of P. F. Strawson's “Freedom and Resentment,” held at The College of William & Mary, September 27–28, 2012. 23 Hume, Davidactually seemed to hold a view somewhere in this vicinity. See, e.g.,A Treatise of Human Nature, ed. Selby-Bigge, L. A. (Oxford: Oxford University Press, 1960), book II, part III. sec. II, 411. See also the helpful discussion in Sher, George, In Praise of Blame (Oxford: Oxford University Press, 2006), ch. 2. 24 So-called out of character actions might seem to pose a problem for a PQC view, but I think there are ways to respond that I will not detail here. For some possibilities, though, see Arpaly, Nomy and Schroeder, Timothy, “Praise, Blame, and the Whole Self,” Philosophical Studies 93 (1999): 161–88, esp. 182–84. 25 Some theorists—e.g., Matthew Talbert and Angela Smith—disagree with the latter assessment, but theirs is not a widely shared sentiment amongst responsibility theorists. At any rate, I hope to provide some reasons in favor of this assessment later in the essay. 26 For discussion of some of the previous cases, see my “Moral Address, Moral Responsibility, and the Boundaries of the Moral Community,” Ethics 118 (2007): 70–108; as well as my “Responsibility and Disability,” Metaphilosophy 40 (2009): 438–61. 27 Shoemaker, David, “Attributability, Answerability, and Accountability: Toward a Wider Theory of Moral Responsibility,” Ethics 121 (2011): 602–32. 30 I am grateful to Michael McKenna for impressing upon me the advantages of putting the point in these terms. See also his Conversation and Responsibility, 69–70. I have also benefited here from conversations with Justin D'Arms, Daniel Jacobson, and Shaun Nichols. 31 See, e.g., Immordino-Yang, Mary Helen and Sylvan, Lesley, “Admiration for Virtue: Neuroscientific Perspectives on a Motivating Emotion,” Contemporary Educational Psychology 35 (2010): 110–15; and Algoe, Sara B. and Haidt, Jonathan, “Witnessing Excellence in Action: The ‘Other-Praising’ Emotions of Elevation, Gratitude, and Admiration,” Journal of Positive Psychology 4 (2009): 105–27. 32 See, e.g., Williams, Bernard, Shame and Necessity (Berkeley, CA: University of California Press, 1993); and Taylor, Gabriele, Pride, Shame, and Guilt: Emotions of Self-Assessment (Oxford: Oxford University Press, 1985). 33 See, e.g., Lickel, Brianet al., “Vicarious Shame and Guilt,” Group Processes & Intergroup Relations 8 (2005): 145–57; Silfver, Miaet al., “The Relation Between Value Priorities and Proneness to Guilt, Shame, and Empathy,” Motivation and Emotion 32 (2008): 69–80; and Parkinson, Brian and Illingworth, Sarah, “Guilt in Response to Blame from Others,” Cognition & Emotion 23 (2009): 1589–1614. 34 See Scanlon, Moral Dimensions, ch. 4. 35 See my “Caring, Identification, and Agency,” Ethics 114 (2003): 91. Cf., Frankfurt, Harry, Necessity, Volition, and Love (Cambridge: Cambridge University Press, 1999), e.g., 159–62; and Jaworska, Agnieszka, “Caring and Internality,” Philosophy and Phenomenological Research 74 (2007): 529–68. 36 The astute reader will have noticed that regret and pride are first-personal, whereas the paradigm emotional pairings attached to character and regard are third-personal. This is primarily because the third-person responses we have to the quality of other people's judgments typically stem from our caring about our own judgments: we care about how others decide primarily as a way to improve how we decide. (It matters to me what Jesus would do primarily insofar as it helps me figure out what I should do.) Given the (typically) derivative nature of our caring about others' judgments, then, I think it best to discuss our paradigm responses in this zone as being targeted to our own judgmental qualities. For those bothered by the asymmetry to the other qualities of will, however, I say more to motivate and defend it in Responsibility from the Margins, unpublished book manuscript. 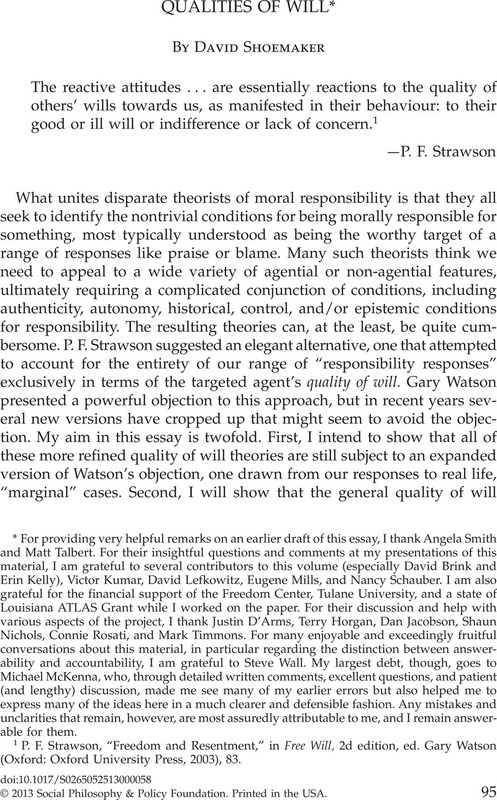 37 See, e.g., Susan Wolf, “Sanity and the Metaphysics of Responsibility,” in Watson, Free Will, 372–87. For other theorists, this way of putting it will be more irritating than helpful, but I maintain it for ease of exposition, and they can substitute it with talk of agential and non-agential attitudinal causes without any real loss. 38 For the classic statement of the former, see Frankfurt, Harry, The Importance of What We Care About (Cambridge: Cambridge University Press, 1988), 11–25, 58–68, and 159–76. For the classic statement of the latter, see Watson, Agency and Answerability, 13–32. 39 See Lippert-Rasmussen, Kasper, “Identification and Responsibility,” Ethical Theory and Moral Practice 6 (2003): 349–76. 40 See, e.g., Frankfurt, The Importance of What We Care About, 85–88. 41 See, e.g., Algoe and Haidt. 42 It may, nevertheless, linger, being “stably recalcitrant” in the words of D'Arms, and Jacobson, . See their “The Significance of Recalcitrant Emotion (or, Anti-quasijudgmentalism),” Royal Institute of Philosophy Supplement 52 (2003): 127–45. This is one of the reasons I think of admiration as a sentiment, an irruptive, pan-cultural emotion with a syndrome of associated thought, feeling, and motivation, one that evaluates objects independently of judgment (see D'Arms, Justin, “Value and the Regulation of the Sentiments,” Philosophical Studies , DOI: 10.1007/s11098-012-0071-9). This is a controversial position, though, and one that I do not defend here. See Responsibility from the Margins for detailed discussion and defense. 43 I take no stand here on whether these are jointly sufficient. 44 See, e.g., Scanlon, What We Owe to Each Other, 18–22. 45 In addition to Scanlon in the previously cited works, Smith, Angelaexplicitly advocates such a view in, e.g., “Attributability, Answerability, and Accountability: In Defense of a Unified Account,” Ethics 122 (2012): 575–89. 46 For those who act from the heart, who are impulsive or guided by unconditional love, actions flowing from their evaluative judgments may actually be out of character. 47 Imagine, for instance, an American Chess Idol, or the actual American (singing) Idol, in which this sort of criticism regularly takes place in just this way. 48 Scanlon, What We Owe to Each Other, 271–72; first emphasis mine; second emphasis in original. 49 Ibid., 272; emphasis mine. 51 Aristotle, Rhetoric 1378a; from a hyptertext resource compiled by Lee Honeycutt from the translation by W. Rhys Roberts. URL: http://rhetoric.eserver.org/aristotle/. 52 There are many who hold such a view. The most prominent include Wallace; and Darwall, Stephen, in The Second-Person Standpoint (Cambridge, MA: Harvard University Press, 2006). I too have explicitly advocated this view in several papers, including “Attributability, Answerability, and Accountability,” as well as “Moral Address, Moral Responsibility, and the Boundaries of the Moral Community.” As will now become obvious, I no longer hold this view. 54 In part because of McKenna, from chap. 8 of his Conversation and Responsibility. 55 Drawn from a case Driver, Julia explores in “The Suberogatory,” Australasian Journal of Philosophy 70 (1992): 288. 56 Drawn from a case Thomson, Judith Jarvis explores in The Realm of Rights (Cambridge, MA: Harvard University Press, 1990), 117. 57 Driver, 287; McKenna, Conversation and Responsibility, 184. 58 Psychopaths, after all, may take seriously my perspective about what pains me, but only insofar as it provides them with information on how best to pain me. I have put this point elsewhere (“Moral Address, Moral Responsibility, and the Boundaries of the Moral Community”) as motivating the requirement that we share the cares of the other. 59 Compare and contrast the discussion in Darwall, 43–48. He focuses solely on the recognitional, but not the emotional, elements of empathy. 60 I lack space to discuss how this account of anger for slights to oneself might be generalized, very naturalistically, to anger for slights to others, but I attempt to do so in Responsibility from the Margins. The story appeals to what I think is a natural empathic extension. 61 Again, I expound on these ideas in Responsibility from the Margins. 62 See, e.g., Wallace, Watson (Agency and Answerability, 279–80), and Shoemaker (“Attributability, Answerability, and Accountability”). Again, I have changed my view. 63 See McKenna, Conversation and Responsibility, 141–46, for a discussion of the harms of holding accountable as mere side effects. 64 Scanlon talks about gratitude as the opposite of resentment in Moral Dimensions, 151–52. 65 See Watson, Agency and Answerability, 219–59. 66 Here is one place where I break, respectively, from McKenna and Watson, among others. 67 For the charge that theories like Watson's are fundamentally forward-looking, see Matthew Talbert's “The Significance of Psychopathic Wrongdoing,” forthcoming in Being Amoral, ed. Thomas Schramme, (MIT Press). 68 Again, I am officially agnostic here on whether these conditions are together sufficient. 69 I should also mention that, insofar as some of the conceptions of responsibility implicate multiple capacities, we may have ambivalent responses within these conceptions as well, where some capacities obtain but others do not. I lack space to discuss this possibility here, but I am grateful to Erin Kelly for drawing my attention to it. 70 See also my “Psychopathy, Responsibility, and the Moral/Conventional Distinction,” Southern Journal of Philosophy 49, Spindel Supplement (2011): 99–124. 71 This is argued for at length in my “Remnants of Character,” unpublished manuscript. * For providing very helpful remarks on an earlier draft of this essay, I thank Angela Smith and Matt Talbert. For their insightful questions and comments at my presentations of this material, I am grateful to several contributors to this volume (especially David Brink and Erin Kelly), Victor Kumar, David Lefkowitz, Eugene Mills, and Nancy Schauber. I am also grateful for the financial support of the Freedom Center, Tulane University, and a state of Louisiana ATLAS Grant while I worked on the paper. For their discussion and help with various aspects of the project, I thank Justin D'Arms, Terry Horgan, Dan Jacobson, Shaun Nichols, Connie Rosati, and Mark Timmons. For many enjoyable and exceedingly fruitful conversations about this material, in particular regarding the distinction between answerability and accountability, I am grateful to Steve Wall. My largest debt, though, goes to Michael McKenna, who, through detailed written comments, excellent questions, and patient (and lengthy) discussion, made me see many of my earlier errors but also helped me to express many of the ideas here in a much clearer and defensible fashion. Any mistakes and unclarities that remain, however, are most assuredly attributable to me, and I remain answerable for them.